What are your order minimums, lead-times and fulfillment times? Standard lead-times are based on order acceptance/confirmation, customer approval of applicable artwork and part type and/or classification. Products ship within 24 business hours. Single-unit orders are permitted with blow-molded products, while full-case quantities are required for injection-molded products. Under the Blue Diamond program, shipping can take up to four weeks, and orders must be in case quantities. What size area and location on your boxes can be used for printing? Each area is slightly different based on the product selected. Contact us for details. What are the artwork requirements for hot stamps, in-mold decorating or printing? We prefer Illustrator files but will also accept Freehand and Photoshop files. Format is AI, EPS, TIFF or JPEG, and quality should be 300 dpi at 100% size. 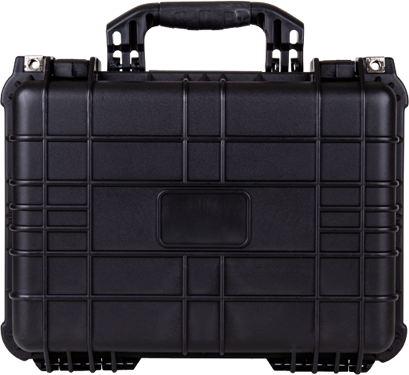 Can you hot stamp a blow-molded case? No, you can only hot stamp an injection-molded box. There are three choices for customizing a blow-molded case: engraving a plate, in-mold decorating (labeling) or standard adhesive labels are the best choices for decorating. These choices typically require a minimum order of 500 pieces and have additional charges associated with set up and/or tooling. Please contact a customer service associate at 800-344-5716 for more details and a quote. How do I know whether to use a blow molded or injection molded product? If a custom interior for presentation and protection is most important, then a blow molded, double-wall case, such as the Infinity, would be the best choice. If compartmentalization and visualization for Point of Purchase is required, one of our injection-molded cases or boxes would be a good choice. What modifications can I make to a stock case? Modifications include interior custom cores, handles, latches, case color and even material. A detailed request for quote (RFQ) should be prepared by our sales staff. Flambeau associates are trained to help you make economical and functional decisions about the right case for your application and product. How do I decide what type of custom interior to use? We offer either custom-molded interiors or custom foam interiors. Although size, weight, application and type of part are considerations, we typically recommend you consider custom foam for annual volumes of 750 units or less. Our Flambeau Technology Center can fabricate a tool for custom-molded interiors, and our staff of engineers would be happy to assist you in the design. What material should I use for my compartmented box application? If clarity is most important, styrene is an excellent choice. If durability is most important, polypropylene is the best choice. If clarity and durability are important, styrene-butadiene copolymer is the best choice. How many times can you open and close the integral hinge before it cracks or breaks? Our integral-hinge boxes are manufactured to withstand thousands of openings. It is reasonable to expect that, under normal use, the hinge will last for the life of the product.